This NASA sky map shows the positions of Venus, Jupiter and the moon on March 26, 2012 during a potentially spectacular conjunction of the three objects. During the past month we've been treated to a sort of "twilight tango" between the two brightest planets, Venus and Jupiter, in the western night sky. Like two ships passing in the night, they have spent the last several weeks first approaching each other, then passing each other on March 13. Venus and Jupiter still adorn our evening sky at dusk, but they're now going their own separate ways after their spectacular mid-March tryst. But one last event is still to occur and will be spread across two nights, on Sunday (March 25) and Monday (March 26). Indeed, the twilight light tango will turn into a pas de trois as our nearest neighbor, the moon, gets involved in this eye-catching celestial scene. 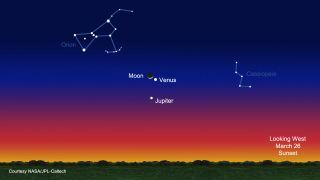 The sky map of Venus, Jupiter and the moon associated with this guide shows where to look in the western sky to see the celestial sight at sunset. The moon and Venus are in conjunction in this image taken at Gobustan National Park in Azerbaijan, on Feb. 25, 2012. The arrangement is all a matter of perspective. So on Sunday evening, a slender sliver of a crescent moon will sit less than 3 degrees to the right and slightly above Jupiter. For North Americans, the two objects appear closest together at around 9 p.m. EDT. Venus will about 10 degrees above them (your clenched fist held at arm's length is roughly equal to 10 degrees). The trio will resemble a long, narrow isosceles triangle with the arrowhead (at Venus) pointing upward. By Monday evening, the moon will have vaulted up to meet Venus. The moon will be a slightly wider crescent, sitting less than 3 degrees to the left and a bit above Venus. Now the triangle configuration will have flipped; the arrowhead (at Jupiter) will be pointing downward. Jupiter will soon be ending its brilliant nearly year-long showing in the coming weeks. Currently, the giant planet is still easy to spot below Venus, but after mid April it will be setting just as evening twilight ends, about 90 minutes after sunset. By the third week of April, Jupiter becomes much harder to see as it sinks lower into the sunset. The last view of it for most people should come on or about April 24. Thereafter, Jupiter will be invisible. It will next return to view before the onset of dawn during the final week of June. In contrast, Venus will be growing ever brighter. Our sister world, now standing at its highest point above the horizon for 2012, currently shines long into the night setting four hours after sunset. On Tuesday (March 27), Venus is at greatest eastern elongation from the sun (46 degrees). Thereafter it will begin descending back toward the western evening horizon, slowly at first, then with increasing speed in May. In a telescope, Venus will appear as a dazzling silver-white "half moon," then gradually become a thick crescent while growing larger as it swings around its orbit closer to Earth. But on Sunday and Monday, Venus will share top billing with Jupiter and the moon. On those evenings, these three brightest objects of the night will call everyone's attention to the western sky as darkness falls. As singer Donna Summer might say, at least so far as this celestial trio is concerned, this is indeed "The Last Dance." If you snap an amazing photo of Venus and Jupiter, or any other skywatching target, and would like to share it for a possible story or image gallery, please contact SPACE.com managing editor Tariq Malik at tmalik@space.com.